I’ve visited Chicago a few times, but it was before Uber and Lyft were a thing. I was faced with hailing a cab and paying a ridiculously high rate to go a short distance. I quickly learned that I preferred to walk the mile or two instead of spending all my money on rides. If Uber or Lyft were around when I visited, I would’ve definitely taken advantage of them. I’m not the only rider who feels this way either — many people are switching from cabs to ridesharing. Uber and Lyft have both seen vast increases in the number of drivers needed for Chi-Town. You and your vehicle will need to meet certain requirements for ride hailing in Chicago. Read the requirements below and be sure to check out the links we’ve shared too for a more detailed list. Lyft, Line, Plus, Premier, Lux and Lux SUV are all available in Chicago. 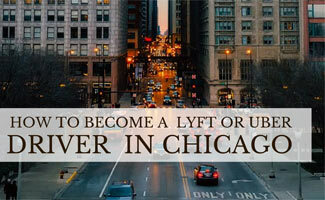 If you want to drive for Lyft Chicago, read the full list of requirements here. UberX, UberSelect, UberXL, UberBlack, UberSUV and UberCab are all available in Los Angeles. Read this list of requirements to drive with Uber Chicago. Pick up rides around these places Monday thru Friday from 6am to 9am and 4pm to 7pm. On the weekends from 5pm to 3am try hitting up these hotspots. Driving with Uber in Chicago can be dangerous if you’re picking up and dropping off in alleyways. This driver has some tips for you, and they work for Lyft drivers too. While driving in the snow or pouring rain is miserable, it can be one of the most profitable times for drivers. People have places to go, and sometimes there are issues with public transit and can’t walk to their destination, so their only option is to hail a ride. If you’re comfortable with it, driving when the weather is bad can bring more money into your pocket in less time. Do you have any tips for Uber and Lyft drivers in Chicago? Guys, Cubs games and Bulls games…any major sporting event, is where the money is at yo!